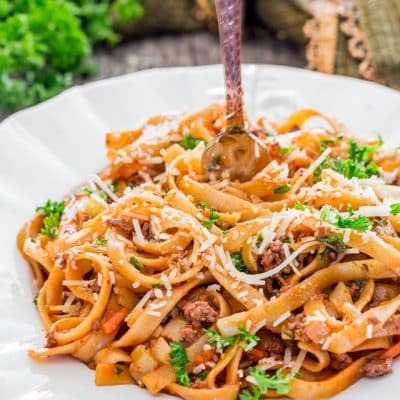 One Pot Beef Ragu Pasta – nothing says comfort food like a big bowl of meaty and delicious pasta. 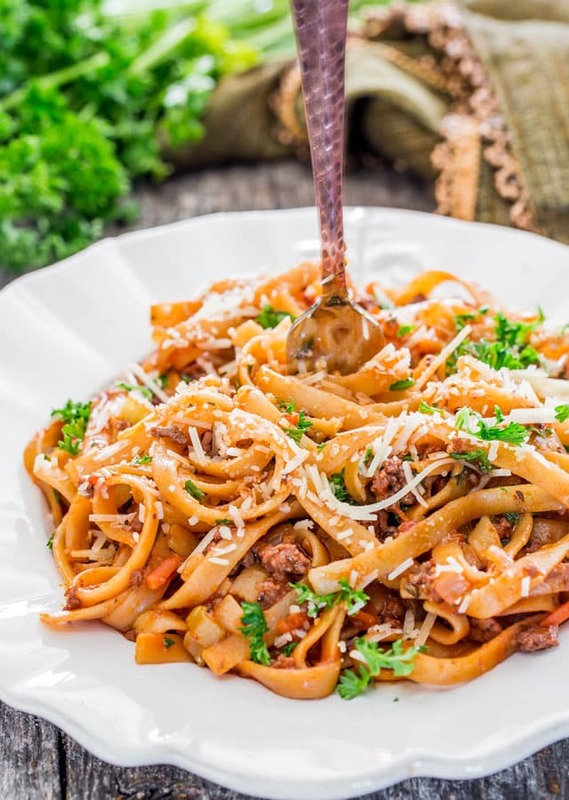 This fettuccine is cooked in a hearty beef sauce making for a quick and easy dinner. This kind of dish brings me back to the days when I used to be single, living by myself right next door to my sister. We each owned our own house, but they were attached, kind of like townhouses. It was ideal for us, we’d always been close so this was perfect, living right next door to each other. Those were the days when I didn’t cook much, mostly because I worked all day long. I commuted for a couple hours every single day which didn’t leave me much time for cooking. However, living right next door to my sister, I used to go there for dinner quite often. Her specialty was spaghetti with a delicious beef ragu. But now that I’m all grown up, ahem, I make my own beef ragu, all in one pot might I add. 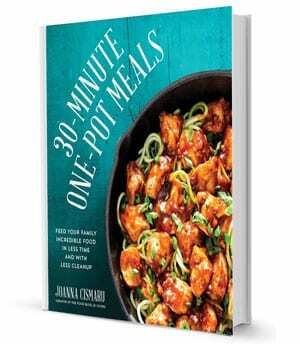 I may not commute for 2 hours every day, but my days are still jam packed so I love one pot dishes, especially quick ones. Ragu typically uses ground meat cooked and sautéed with vegetables in a liquid. Different meats can be used such as chicken, beef, pork, duck, lamb, etc. Super easy to make. Start by cooking some ground beef, add some veggies like onions, carrots and celery. Add in some garlic of course. I hardly make anything without garlic. A bit of oregano, and I used fresh oregano because I love the smell of it. The liquids go in next, a bit of red wine, some beef broth and lots of vegetable broth, and some tomato sauce. Add the pasta and cook for 20 minutes. You’ll have to stir a bit occasionally, to make sure the noodles don’t stick together, but really that’s pretty much all there is to this dish. I had a few taste testers for this, my guys downstairs who are working hard on finishing my basement, my friend and my husband and they all loved it. Now I served this with Parmesan cheese, but if you want to be different, try this with some feta cheese, you’ll see what I mean. It’s good! Trust me! Mangia Bene! That means good eats, so let’s eat! 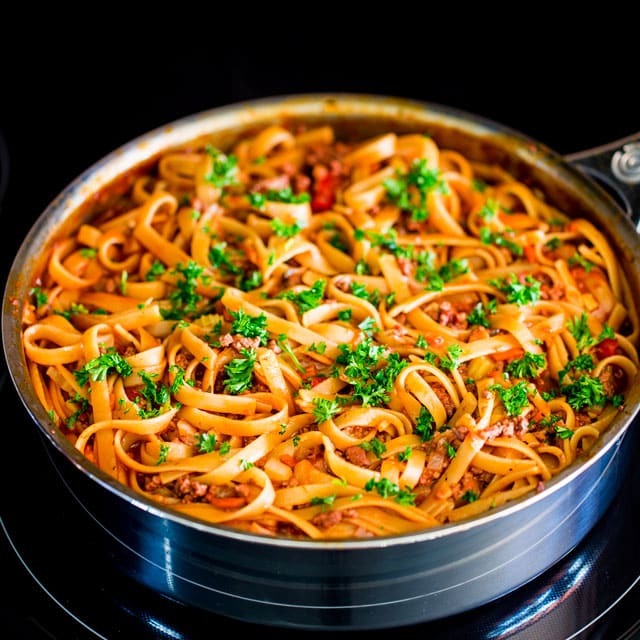 One Pot Beef Ragu Pasta - nothing says comfort food like a big bowl of meaty and delicious pasta. 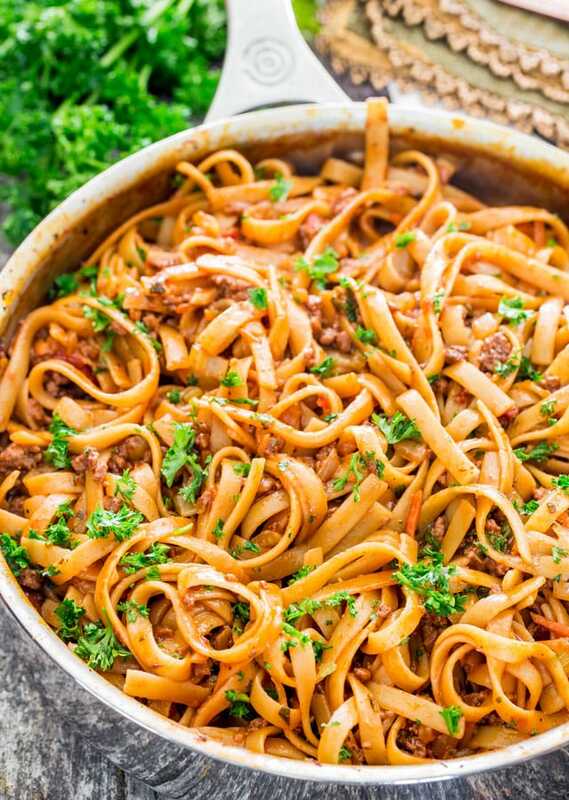 This fettuccine is cooked in a hearty beef sauce making for a quick and easy dinner. Add the ground beef to a large saucepan or a Dutch oven and cook over medium-high heat, breaking up the meat with a wooden spoon, until no longer pink, about 5 minutes. Add the onion, carrot, celery to the pan and cook, stirring occasionally, for about 3 to 5 minutes or until the vegetables soften. Add the minced garlic, oregano, red wine, beef broth, crushed tomatoes and stir. Season with salt and pepper as necessary. Add the fettuccine or spaghetti, the vegetable broth and cook for about 20 minutes or until the pasta is al dente or to your liking. Make sure to stir occasionally. Garnish with parsley and Parmesan cheese, and serve. Nutritional information is per serving and does not include Parmesan cheese. 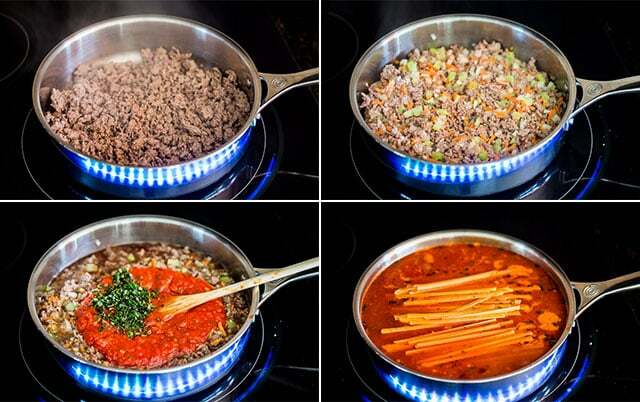 You can use any type of pasta that you have handy. You can use extra beef broth or chicken broth instead of vegetable. Really delicious recipe! I didn’t even use the red wine and used all beef broth since I had a whole carton of it. 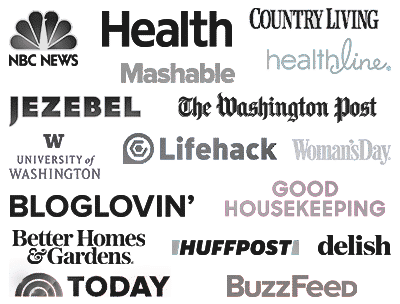 HI.DID YOU NOTE THE MENTION OF “RED WHINE”IN COOKING INST.??? I followed the directions to the T and mine came out too watery… what can I do tonthicken up the sauce? You can crank the heat to medium high and let the water content reduce while stirring often to prevent burning. If you want it to thicken immediately, add a cornstarch slurry and whisk it into your sauce well. Let it come to a boil and the sauce will thicken. Loved it! It was so easy and the spaghetti had a great texture. Made this for dinner tonight was enjoyed by all. This is definitely a keeper. You could, the veggie broth has a richer color, but I don’t think there will be noticeable difference in the taste. Where did you find such pretty pots and pans???? LOL I love my Le Creuset pots and pans, so I buy them all either on amazon or at the Le Creuset store.